I’m a trash talker! I love to talk trash. Specifically, plastic trash. So here is my trash talk for today; recycle programs in Mahahual are a waste of time and energy. There I said it! It is sad, but true. Over the years, I’ve seen many tried here and none have managed to really work, or even last beyond the energy, the good intentions, hard work and benevolence of those who organized them. The sad reality is that moving plastic all over for recycle is a net energy loser, as well as economic loser, especially when you are in a remote area. The sustained effort needed to run a program is just too costly and time consuming. The result is our expensive landfills are filling with plastic bottles and the rise in tourism will only increase the problem. The answer is in fact recycling, but in a different fashion than what has been tried up until now. Too many recycle efforts rely on volunteer help and the long term sustainability, especially in a seasonal area like ours, is difficult. The problem is about distance, and like time, distance is money. Locally, the distance someone has to transport the plastic, after they hand load it, is too far to make the trip worth the effort. The reason is that plastic still has to be transported to a place to bundle it, then transported to another place to be shredded, then some place to be used in the manufacturing of a product. By the time you pay for all that movement, it is cheaper to just produce more plastic! Which takes us back to our landfill problem. One of the best ways to fix a problem is to figure out how someone can make money off of doing so. Coming up with a recycle program that works long term is really just that simple. Or at least it should be. Removing the problem of distance is easy. We just need to move the recycle process closer to the source and Mexico has just the tool to do that; the “maquiladora de bajo insumos”. Typically, this status has been used mainly along the US border, and used by manufacturing companies from the US. Companies are given incentives like reduced tarrifs, and easy transport regulations by the government for example, which when combined with lower labor rates and regulation, make maquiladora manufacturing an attractive option for large companies, but also a great job generator and tax payer as well for Mexico. Today, there are new technologies and companies out there that can recycle and remanufacture in a single process, eliminating the high costs associated with the traditional recycle process. These sort of companies are the type that can resolve our plastic problem and make a profit at the same time, and the type of companies Mexico needs to aggressively pursue to relocate to our area. From construction products like deck planks, to plastic pipes, furniture and even synthetic crude oil, companies around the world are now using one step recycle/manufacture processes. They have the equipment and technology to do what they do, but we actually have everything else they also need. We have an endless stream of plastic bottles a giant tourism industry will produce, cheap labor to gather and transport, cheap land and construction costs, and when you throw in maquiladora status, it is too good of deal to pass up for many companies. Maquiladora have always been associated with US companies and used along the border areas. But there is no reason the same status could not be used to attract a company to Quintana Roo. Companies in high labor and tax countries like the US, Canada and Germany, should find the low labor, material and real estate costs combined with lower government regulations and taxes, favorably enough to consider moving an operation here. When picking up trash goes from volunteer work, to the collection of raw materials to be sold to a manufacturing company, you will see the end to both, our plastic trash problems and our rapidly filling landfill problem, and in the interim, provide needed jobs for our area. Imagine a circle of tourist consuming cold drinks on our beaches in Mexico, and then the bottles being turned into fence materials that end up in those same foreigner’s back yards. Now that is circular recycling at it’s best! 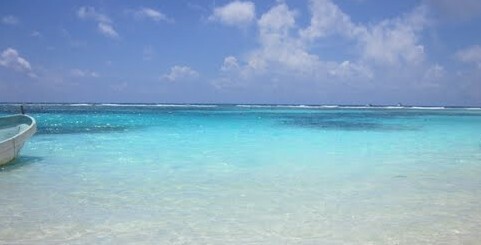 This entry was posted in Mahahual News, Tales From Mahahual. Bookmark the permalink.